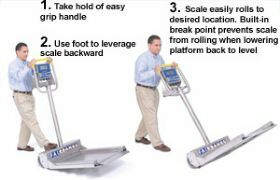 Fairbanks' AegisÂ® Transport Scales' built-in, two-wheel design, allows for easy portability - just tilt the scale back and move it to the next location. Fairbanks' AegisÂ® Transport design is totally unique to the drum scale market. You won't find another manufacturer's drum scale that can compete with the Transport's level of portability, rugged design and precision accuracy. These scales come packaged with an FB2250 indicator that includes: a 6-digit green backlit LCD display that promotes ease of visibility, Stainless Steel Nema 4X enclosure, and can operate on 120 VAC power or with the integral rechargebale battery. RS232 Output included. FOB Shipping Point. Product No. Material Platform Size Cap. (lbs.) Wt. (lbs.) Price Ea.